Forum Index > Historical Arms Talk > Most authentic(ish) mail for a viking. Posted: Thu 23 Jun, 2016 6:51 am Post subject: Most authentic(ish) mail for a viking. Nobody seems to make mixed round/flat ring mail these days and the butted mail seems to be inauthentic for the period so that's off the table. The round rings riveted mail looks pretty authentic(ish) but it is heavy. The Battle Merchant RRR version of the shirt I'm interested in weighs 22kg. The Flat Rings mail I'm not sure about. Viking period mail did have some flat rings but they are not as flat as the flat ring mail for sale in this day and age. The flat ring shirts equivalent to the RRR version I mentioned above are significantly lighter with the both versions weighing only ~14 kg as opposed to 22kg for the RRR version and I'm guessing on a hot day in summer I'm really going to feel those 8 extra kilograms of the RRR shirt. It's very tempting to pick the flat ring shirts because they weigh less but there is the accuracy concern. Exactly how horribly inaccurate is the flat ring mail from Battle Merchant or other modern vendors? Is this the kind of 'lilliputian soda can ring' mail that people here keep talking about? Which kind of mail is easier on gambesons/aketons, wedge or dome riveted? Or is it the flat joint surfaces on the mail rings that tear up the fabric? I just finished laboriously hand sewing a gambeson because hand sewn garments are a requirement for some events I go to and while I know my precious new gambeson will get torn up I also don't want to tear it up any more quickly than absolutely necessary. I'm putting on my rubber shoes for what may be a very slippery slope to come. For a long time people have touted the soda tab Indian riveted mail as "more authentic" than butted rings. It is no more authentic because the processes used to make it, the materials used, and the final appearance are not historic. The only thing it has going for it is the rivet itself. It's like putting a Ferrari emblem on a Hyundai and saying "it is more authentic," vs a replica Ferrari without the emblem. Yes, the Hyundai has the emblem alright, but it does not look like a Ferrari. 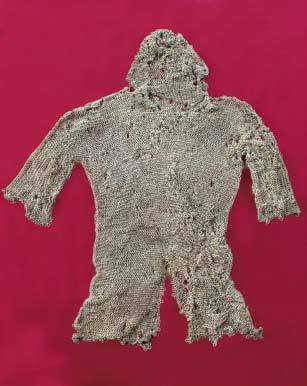 In fact, well made butted mail armor LOOKS more like historic examples of mail than ANY of the soda tab riveted mail available. In my opinion, since neither type is the "real deal" I just go for looks and make my own butted mail since I am not relying on it to save my life in hand to hand combat. Remember though: most combatants were NOT armored at all, especially vikings. A tunic, breeches, shield, belt, axe or spear, and period shoes would kit you out completely and believably. You could even grab a helmet and a knife of some sort for extra flair. You could always spend several thousand dollars for more authentic mail, which is also a historically accurate decision if you could afford such a kit. I look at things from the viewpoint of doing one-man school demos (among other reenactments!). If I have to hand a piece of butted mail to my audience and then explain how on the REAL stuff at least half the rings were riveted, it's a pain. With Indian-made riveted mail, I don't have to do that. They can see the rings and rivets, and you can see the understanding in their faces. Certainly with *some* audiences I can get more into the nitty-gritty of ring shape details, etc., but for them I can always carry the scrap of Erik Schmid mail that I have. So Yes, I would go for "bad" riveted mail over butted any day, if I could afford it. That said, 22 KG??? They can keep that! Even if that's just a *shipping* weight, it's too much. There are certainly other suppliers out there, so I'd say shop around. I could swear I've seen round-wire rings with round rivets, alternating with flat solid rings, too, not that I've actively hunted for it. SOMEone has to be making it. At a massed reenactment I often go without armor, just because as has been said, most guys didn't have it. But if it's just me doing show and tell, I absolutely want a mailshirt with me, with a spread of weapons, helmets, and shields far greater than any single warrior would have! Just to show as many options as possible. That said, 22 KG??? They can keep that! Even if that's just a *shipping* weight, it's too much. I don't think so, 22kg is about 50 lb which is rather a bit on the heavy side. 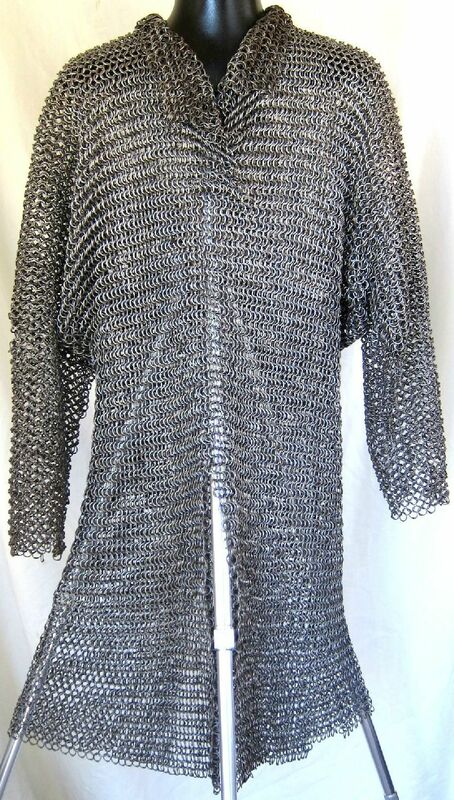 However, a similar short sleeved, short skirt haubergon from chainmail.com weighs in at about 30 lb and thats intended for a smaller more gracile guy than me. My butted mail, short sleeve, waist length haubergon weighs 12 kg. The weight depends on the wearer and I'm about 6 ft 4 in tall and built like a troll but I can se how if you are 5ft 7in and built like an elf then 22kg will sound like a lot but it's not a killer although I'd certainly welcome every gram of weight that I can save. You never had anyone hit you anything substantial in earnest, have you? I've seen people bash links off butted mail shirt with rattan sticks, and I live in an light hitting kingdom. Also my experience with butted mails shirt is that they very uncomfortable since the open ends where the gaps tear and pull as your and at your hair when are trying to take the think off. It is true that no one makes perfectly authentic riveted mail but for more durability and comfort, I would take badly riveted over butted any day. Also, not all riveted looks like soda tabs and bit of butted looks just as fake. I got my round ring round rivet, flat solid ring mix hauberk from a company called Armoured Up, in the UK. He is on Facebook, so might be worth checking him out if that is what you are looking for. Build quality wasn't the best, but reasonable price. 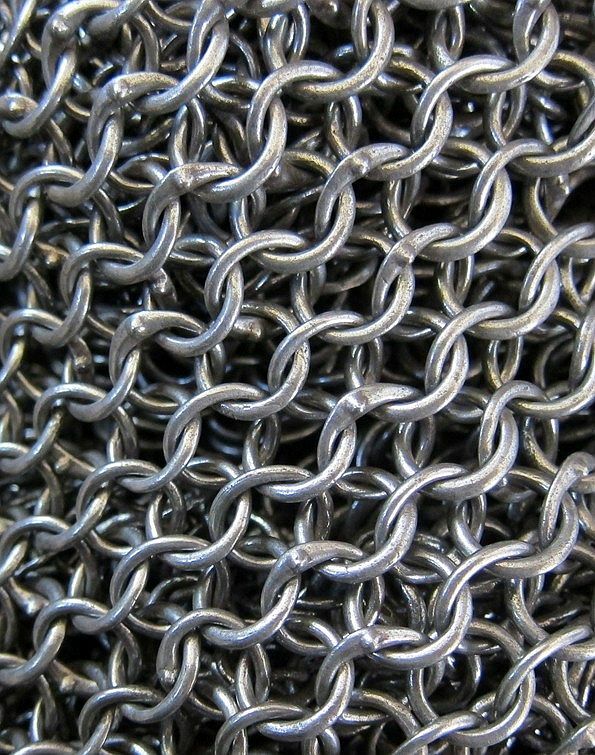 I got a butted spring steel chainmail haubergeon (12 kg) from Battle Merchant years ago (made probably in Pakistan for Ulfberth) and I'm still quite happy with it. It lost a few rings, true, but those could be replaced with little effort. The steel used looks and feels great and holds up to quite some rigor. Earlier this year I also got a flat ring riveted / flat ring punched mix (FRM, 8 kg) from the same company and exporter. Sadly the quality is absolutely shoddy and I'm having it returned. The flat rings were flimsy as all hell, rivets stick out horribly, making the mail stick to each other, especially while dressing up but also even while just moving around (sleeves stick to body, body sticks to body if you bend over etc etc), quite a few rings do not have rivets in them or have lost them due to the rivet tearing out the ring. Curiously my reenactment group's leader also has FRM mail from Battle Merchant, bought two years ago or so, and that one is pretty good. Rings are of much higher quality, rivets are closed properly and don't stick out nearly as much and rarely ever is a rivet missing. Hit and miss and hit, apparently. As for historical accuracy: from what I know anything outside of wedge riveted mail would be period accurate, but butted probably wouldn't have been the armor of choice even in the early middle age, and thus at best rare. Just to tweak that, from what I've heard, ALL known surviving European mail meant for battle is riveted. Butted is only seen for decorative bits like brass edgings and such, or sometimes repairs (which may be modern). Sorry to hear about your experience with the bad-quality stuff, though, ack! Thanks for posting that. No way I'd use butted mail as any sort of defense, and I wouldn't use any mail at all as a defense in rattan combat. I was talking PURELY from an aesthetics point of view. Butted mail=ahistorical, soda tab mail=ahistorical. Good quality butted mail LOOKS more like viking age mail than wedge riveted or dome riveted Indian soda tab, just minus the rivets. The stuff I make has no open gappy areas on the cuts, just looks like a closed ring with a line. I specified that I was talking about soda tab mail vs butted, not quality riveted mail. Vegard Vike's done the analysis of the Gjermundbu mail. The solids should be punched, and nearly square in section, and the riveted rings should be round wire with round rivets. Perhaps some of the lorica hamata replicas are made this way? 1. Butted is extremely easy to repair. When I was far more active in that type of fighting I kept a gallon bucket of loose links and a couple of pairs of pliers in my vehicle. If someone did hit me hard enough to pop a few links from my butted mail (and some of the links were lost), it was a quick and easy patching. 2. Wear something to protect your skin/hair, even if it's just to throw on a stocking cap long enough to pull the chain on/off over your head. However, if you're wearing the mail without anything underneath it on your torso . . . well . . . I'd say that's highly unadvisable and unwise for anyone to do (especially if you're a hairy guy), but I doubt that's what you're referring to. 3. The lesser durability of butted mail is offset by the costs and time requirements. Butted mail is generally cheaper and easier on people's wallets, even in the long run with the cheaper maintenance costs. On the same token, butted mail is still highly recognized as reasonable and functional armor for most combat games or functions/events, regardless of accuracy, so they know that they can't really go wrong with it in most situations. Now, granted, when it comes to durability and protection I'd much rather have riveted mail, but for many of the simple combat games out there that level of protection isn't needed, but what I do need is a cheap "beater" that's quick to repair and get back into another game/fight/battle with. That's why my "cheap" hauberk w/ coif is butted mail but my nice plate & chain "half plate" set uses riveted mail. I hate it when those riveted links pop because the repair is nowhere near as simple or quick, and it requires more tools/time and a reasonably solid work station. If enough riveted links pop from really nasty hit(s) then the mail is done for the day, period; and if any moderate-large quantity of rings blow from impacts, then the repairs are going to kill another day for me, too, in later repairs. If the same amount -or even more- rings blow on my butted mail, I can normally repair it with a pair of pliers and a bucket of matching rings in under an hour. It might not look pretty at the time, but it doesn't end my entertainment for the day. As for the wear on the gambeson and answering the OP's concerns more, riveted of any type is almost guaranteed to be less wear on your gambeson than any butted mail. If budget is not a concern, definitely get the riveted of some kind. Think of what Philip mentioned on the links catching skin/hair and then apply it to the threads of your gambeson. Particularly if it's hand-stitched (which is likely not as tight or uniform of stitching as a machine), when those links catch a stitch on your gambeson there is always the chance they could rip them out. That said, almost anything you buy is not going to be 100% flawlessly accurate; and you can't please everyone. What works and is considered accurate for one organization is quite possibly frowned upon in another for the exact same set of kit. So I'd look into getting what is most accurate and appealing from your own perspective; and what works best for your favorite events/organizations. Now, personally speaking and to possibly help in your decision, my riveted mail has domed rivets and I can't remember any time they've ever caught on any fabric I'm wearing underneath (whether an under-armor shirt because it's going to be hot at the ren-fest or whether it's gambeson at a fighting event). I have no opinion or experience with wearing wedged rivets, so hopefully others can provide input on that. EDIT: rewrite of last paragraph Ok I found the 22kg shirt you're talking about, and considering it's an XL full sleeve, full length hauberk that weight isn't that bad . . . it's pretty much expected for that size. I'm only 5'3", but I'm built like a friggin dwarf from D&D or something and I always wear pretty heavy armor for any event. Even at my height/build my full hauberk is still something like 35-40lbs (15.8-18.2kg). You'll be surprised at how well that armor wears. However, that weight is coming from the fact that you're getting a full Hauberk and not a much shorter and lighter Haubergeon or Byrnie. IMO a shirt made from alternating rows of butted and solid links looks a lot better than the Indian maiI. If I needed something to show an audience then I'd have some patches of well made riveted mail to hand out. I find it hard to believe that it is 22kg / 48lb!!!! The heaviest antique European hauberk that I am aware of is full length with heavy links and it is 37lbs / 16.7kg, the majority of antique European hauberks that have a weight stated is quite a bit less than that, any idea what is causing these to weigh so much more than antique examples?? When the weight of some of the items in various museum catalogues were checked, they turned out to be different to the weights in the catalogues. It has happened in the MET, Wallace, Higgins, etc. Best to ask a curator to double-check the weight before relying on the figure in a catalogue. Although we're still waiting for detailed information from the museum (Museum of Polimlje, Berane, Montenegro), there is the reported 18.5kg of the hauberk from Donja Rzanica, Montenegro. If it's an accurate wieght on a genuine find, it will be the heaviest of which I'm aware. Sounds great, where do you get your patches to hand out? Do you make your own? I purchased some Turko-Persian and Indian pieces from antique dealers. Still looking for a European piece at a decent price. I also have some pieces that I've made myself and a patch of the Roman scaled mail that Erik included with the 2nd vol of his MRS Journal. FWIW I can't stab a knife through my butted-solid mail no matter how hard I hit it. Wow! What's the story on that piece? It looks like it could have came from the 11th-13th c.
The weight came from the owner, 37lbs. Oh, yes, that's the one I had through my hands. I advised the owner to hold onto it till we could find out more about it, but unfortunately he didn't. I've been meaning to post a lot more data about it, as I think it could be very important.